This square is located in the middle of downtown and very easy to access. It's a five minute walk from Main Station. 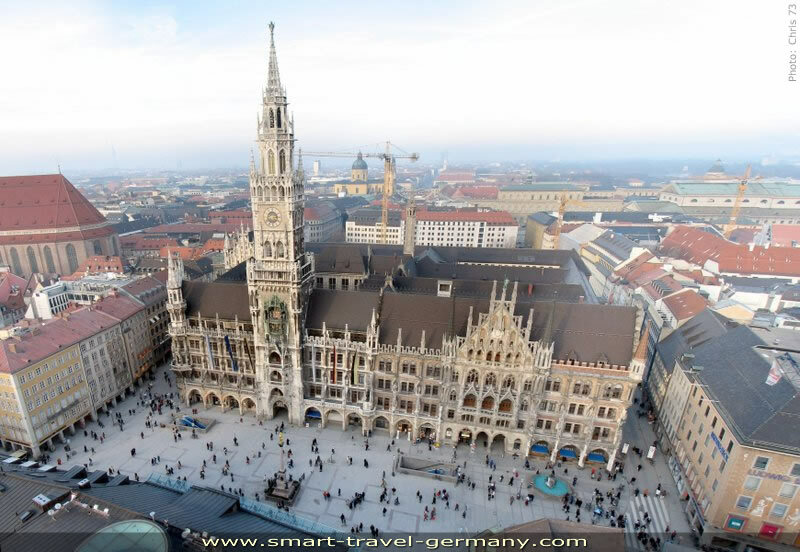 Named after the column of the Virgin Mary at its center, the sqare is famous for its Neo-Gothic Town Hall and the well-known Glockenspiel regularly playing at the New City Hall (see below). The Munich Marienplatz is site for the city's Founding Festival as well as Carneval celebrations and the popular Christmas market. The Old Town Hall is situated at the eastern end of Marienplatz. It has been constructed in 1474 in Gothic style. It was destroyed during the Second World War. The city restored the building in the 50's and 60's. Council hall and ballroom are still used for concerts, lectures and receptions. The tower hosts a museum featuring old toys. Built from 1867 to 1909 in Flanders Gothic style, its façade (over 300 feet in length!) features strikingly elaborate stone ornamentation. Its 260-foot tower is besides St. Peter's Church and the towers of the Cathedral one of Munich's most distinctive landmarks. Its carillon is the largest carillon in Germany. When the mechanism (the world famous Glockenspiel) is activated (at 11am, noon, and 5pm), brightly coloured figures in enamelled copper emerge. They are nearly lifesize and perform the traditional Coopers' Dance (funny!) and a jousting match. It is very amusing and popular. Note: You don't know the above signs? Here is an explanation.